Xaver Imfeld from Sarnen  was an extraordinarily talented and innovative engineer and topographer. He was leading in the fields of cartography, panorama drawing, construction of mountain railways, and terrain modelling . 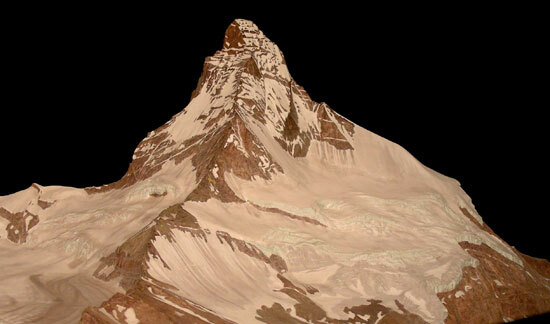 He created several alpine terrain models at the scale of 1:25,000, but also technical and scientific models in larger scales. He also sold paperweight models of different mountains that were produced by galvanization, an electrochemical processes producing hollow metal bodies. His two masterpieces, however, were the best models made until then: In 1896 he showed at the Swiss national exhibition in Geneva  the “most beautiful model of the most beautiful mountain of the world” , a model of the famous Matterhorn in the large scale of 1:5,000 with an extent of 96 x 140 cm. Several casts of this model exist in different museums. His second masterpiece was the model of the Jungfrau group, created within three years (18971900) in the scale of 1:2,500 . It served for the promotion of the Jungfrau railway, which then was under construction, and it was an eye catcher at the 1900 World Fair in Paris. Temporarily, more than 30 persons were engaged in manufacturing this relief with a dimension of 550 x 450 cm, covering an area of 25 m2 and representing an altitude difference of more than 3,500 m (corresponding to 140 cm in the model). The forest was represented by about 600,000 little trees, consisting of tiny green painted brushes . Imfeld did not paint his models on his own, except for his first works . The painter of the Jungfrau model was the church painter Anton Stockmann (18481940), also from Sarnen. But this painting was not really satisfying; only two years later (1902), the model was painted again by Fridolin Becker. Becker was professor for cartography in Zurich between 1890 and 1921, and one of the best cartographic painters of that time . Thus, the best modeller and the best painter created this fantastic model together . At the World Fair in Paris, the relief was illuminated with coloured light to simulate different times of day and the legendary alpenglow . Later on, the model was exhibited in several cities in Europe before it found its place in the Alpine Museum in Munich. Unfortunately, the only existing exemplar was destroyed at the end of World War II when the Allies bombed Munich . The first two paragraphs base on: Gygax, Fritz. Das topographische Relief in der Schweiz.1937. S.47-55. Caminada, Paul. Pioniere der Alpentopographie. 2003. S.186. Penck, Albrecht. Neue Reliefs der Alpen. 1904. S.29,30. Imhof, Eduard. Bildhauer der Berge. 1981. S.130. The next two pargraphs base on: Wehrli, Leo. Das Imfeld’sche Jungfrau-Relief und die Entwicklung der Reliefkunst in der Schweiz. 1900. and Gygax, Fritz. Das topographische Relief in der Schweiz.1937. S.47-55. Gygax, Fritz. Das topographische Relief in der Schweiz. 1937. S.51. and Wehrli, Leo. Das Imfeld’sche Jungfrau-Relief und die Entwicklung der Reliefkunst in der Schweiz. 1900. S.238. Penck, Albrecht. Neue Reliefs der Alpen. 1904. S.29. N.N. Das Imfeldsche Relief der Jungfraugruppe. 1902. S.106. About the relation of Imfeld and Becker see Penck, Albrecht. Neue Reliefs der Alpen. 1904. S.29. Wehrli, Leo. Das Imfeld’sche Jungfrau-Relief und die Entwicklung der Reliefkunst in der Schweiz. 1900. S.238.